21 April, 2014. It was a Monday. 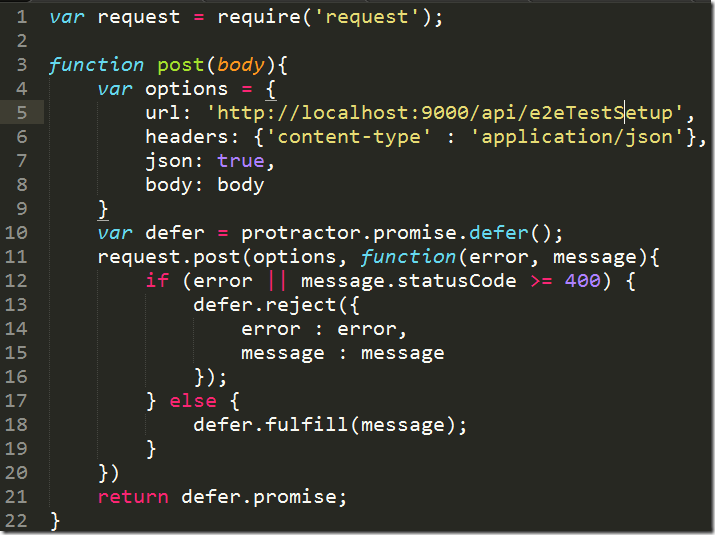 In my previous post I introduced end-to-end testing (E2E testing) of Angular applications using Protractor. In this post I will show how we solve the problem when we need to write an E2E test that involves connecting to and getting some data from an external service provider that is either not under our control or that we explicitly do not want to include in our tests. One possibility is to fake or mock this external service provider. This is exactly the approach that we are taking in our team and that I am going to explain here in detail. Of course one can say that mocking a part of the system defeats the purpose of E2E testing. This is a valid point but we have to see and also acknowledge that it is not always possible to include all parts of a system in a comprehensive test, reasons are either of technical nature or of negative cost versus benefit ratio. Let’s just assume we are using a service from a credit card provider to check whether or not a credit card is valid and if so execute a transaction. In such a situation we should assume that the external service has been tested and is reliable. We can thus mock this service. When we talk about writing E2E tests then we really mean testing all the stuff that we (my teams) build and we thus control from end to end. 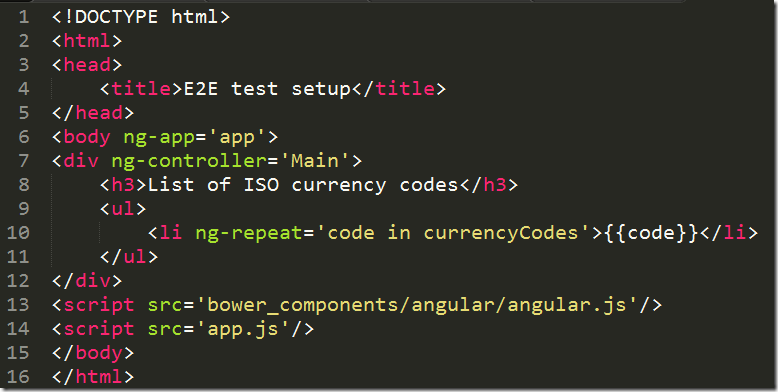 You can find the list of all previous posts of this series about Angular JS here. 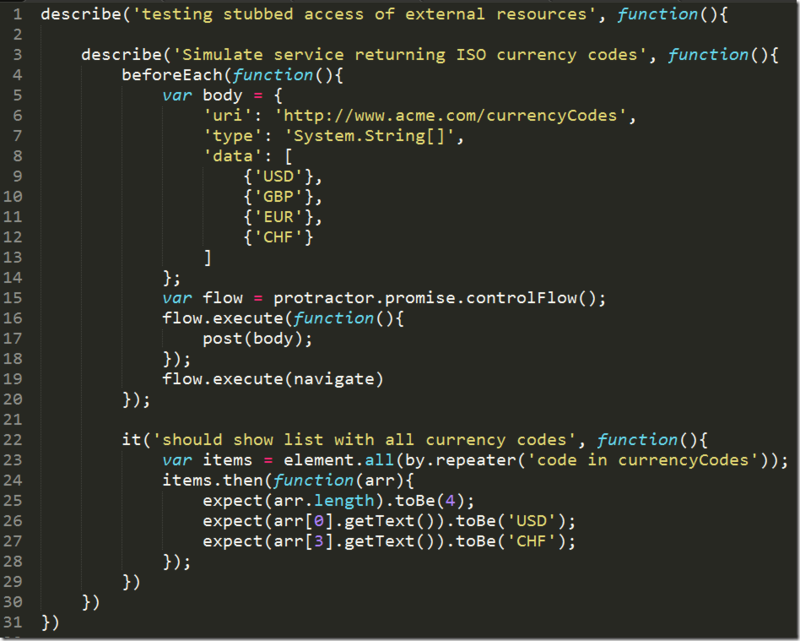 On line 10 and 11 we get the list of ISO currency codes from the REST API of the external service provider www.acme.com. Now let’s assume that the above call would cost us 10 cents each time we call it. Thus it makes sense avoid that call during our automated test runs and replace it by a faked call which serves pre-canned data. Another scenario might be that we want to simulate the situation where this external service provider is down and/or the call times out. Another scenario we might want to test is when the external provider delivers data not in the expected format or quality. Given all this we have to come to the conclusion that it is really best if we fake this call. 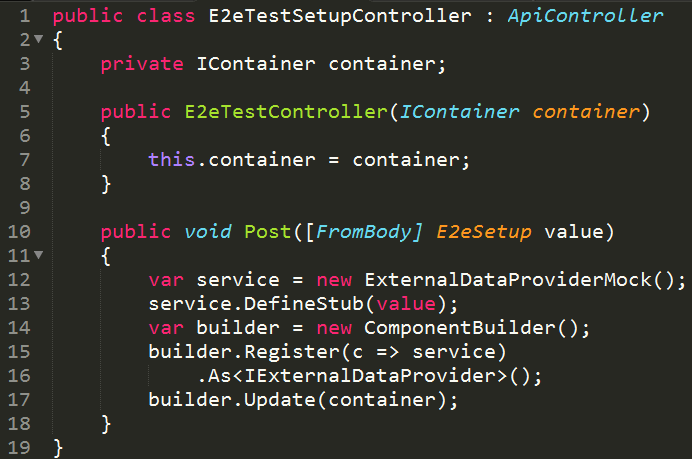 On line 5 I get the existing IoC container instance via dependency injection (we use the Autofac adapter for Web API to enable DI in the controllers). On line 12 we create a new instance of the mocked service and stub it with the data provided to the Post method on line 13. Then on line 14 through 16 we create a new component builder, register the service mock with this builder and update the container with this registration. The new registration for IExternalDataProvider will replace the default one. On line 3 we define a dictionary as cache, where the key is the URI and the value is the pre-canned data for the specific URI. We use this cache on line 16 to serve our pre-canned data whenever the Get method is called with a certain URI. 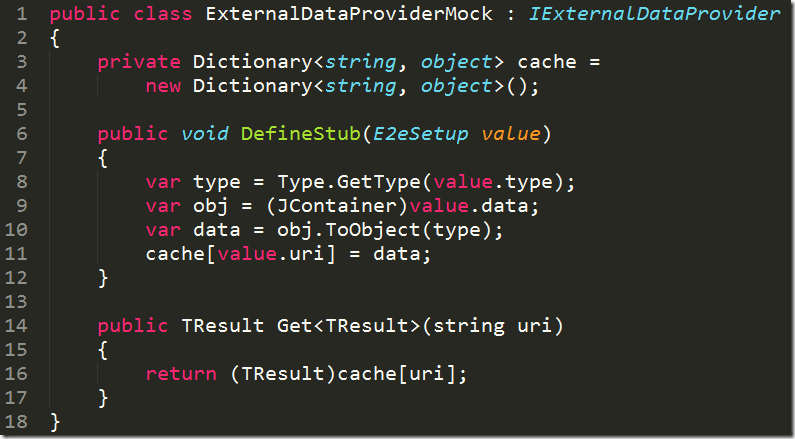 We can configure the cache by calling the DefineStub method and passing a value of type E2eSetup. This parameter contains the URI of the external service we want to call, the full name of the type used as return value of the Get method and the pre-canned data that we want this fake service to return for the given URI. We use this information on line 8 on line to construct the type of the return value and then on line 9 & 10 de-serialize the data from its representation as JSON formatted object into a .NET type. Finally on line 11 we cache the value using the URI as key. Now that we have finished our server side implementation we are ready to tackle the client side. Remember, the goal is to write E2E tests that instead of using the real service façade IExternalDataProvider used the mock that we just described above. How can we achieve that? In all our tests we can now use this helper function to easily call the backend and just pass the payload (body) for the post method. 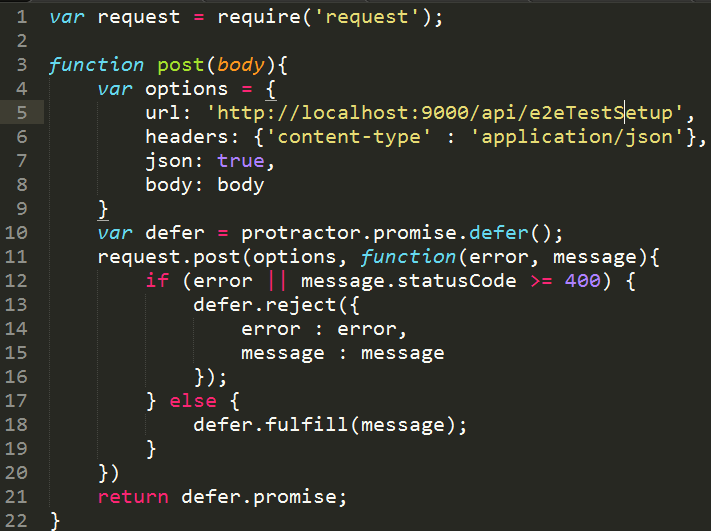 Note that on line 5 we assume that our web server that we use during the automated test run listens on port 9000. 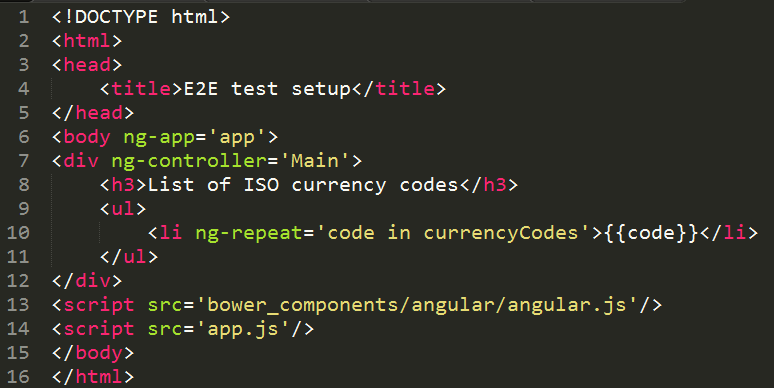 Also note that in order to work correctly we need to set the content-type to application/json (line 6) as well as set json to true (line 7) although to me this seems somewhat redundant… Any call to the above post method will be handled by our E2eTestSetupController introduced above. On line 5 we define the data that we want to post to the E2eTestSetupController and on line 17 we call the post method passing this data. The call to the post method is asynchronous and to make sure that the call is completed before the navigate function is called (line 19) we need to serialize the function calls. We can do this by using the infrastructure provided by protractor. Protractor gives us access to the control flow (line 15) which manages this for us. 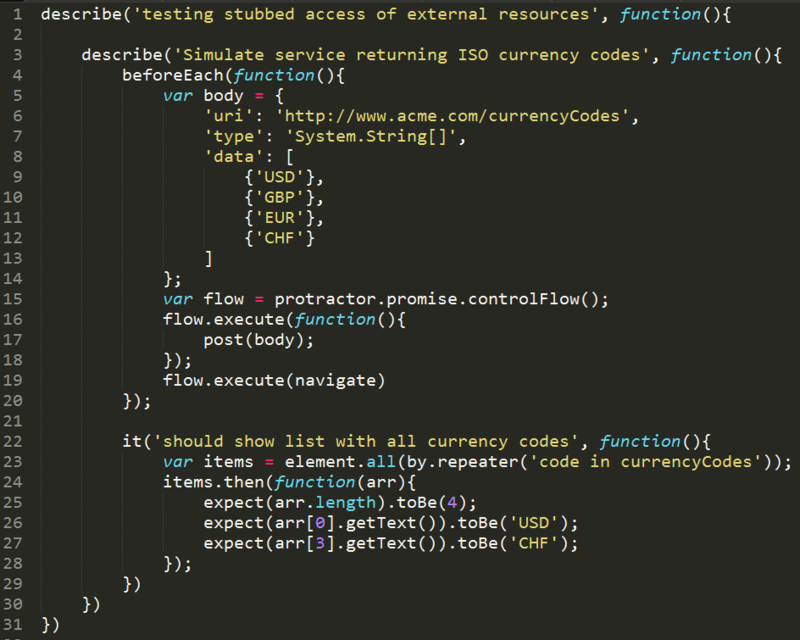 We can just add our asynchronous function calls to the flow using its execute method. Finally on line 22ff we can write a test that verifies our expectations. 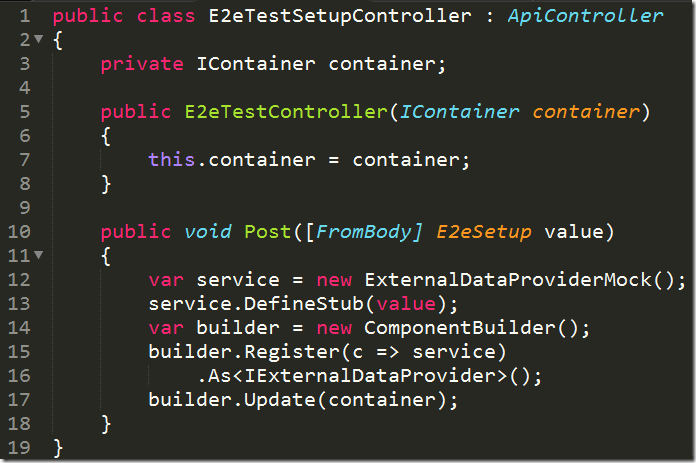 In this post I have shown how we mock or fake external dependencies during our end-to-end tests. With this technique we are able to simulate any boundary condition for a system that is not under our direct control or that we purposely do not want to include in the end-to-end test.